For the first time in two decades, border crossings between Ethiopia and Eritrea are open. The formerly warring countries reopened crossing points at the border, allowing separated families to reunite. The openings occurred Tuesday at the start of the Ethiopian New Year. Hundreds celebrated by hugging one another, and some shed tears as leaders from both nations led celebrations to mark the re-opening of two border posts. 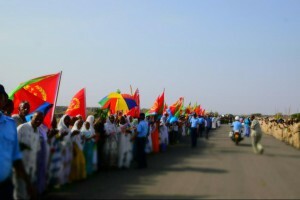 Eritrean President Isaias Afwerki and Ethiopian Prime Minister Abiy Ahmed opened the Debay Sima-Burre and Serha-Zalambesa border points. Eritrean Information Minister Yemane Meskel shared images of the historic events online. Earlier Tuesday, Ahmed and Afwerki visited their troops stationed in Burre, which saw some of the most intense fighting during the war that lasted for two years at the end of the 1990s. Eritrea was formally part of Ethiopia for decades, until its independence was fully recognized in 1993. Leaders of both countries signed an agreement in July to formally announce the end of the conflict. The settlement came just weeks after an announcement from Ethiopia’s ruling party for plans to revive the dormant 18-year-old Algiers peace accord. More than 70,000 people died during the conflict, which began over disputes about where the exact location of the border should be. The 2000 Algiers accord gave the disputed territory of Badme to Eritrea, but it was never fully implemented because Ethiopia disagreed with the plan. There have been armed confrontations ever since. Eritrea re-opened its embassy in Addis Ababa in July, signaling an end to the 20-year-old stalemate.